← “Hurricane” by Bob Dylan. Does it matter if it is not totally accurate? And so what I guess is Dylan’s longest and most fruitful period of collaboration with another writer (or have I been focussed on this period for so long I’ve forgotten something – tell me if so) comes to an end with Romance in Durango. Along with Black Diamond Bay, which it is linked to on the album, it represents the high point of the work with Jacques Levy – and there is no doubt that we are all the richer for it. Indeed, once again, when we focus on Dylan’s songs in the order that they were written in, rather than the order in which they appear on an album, they do make a lot more sense, in terms of understanding Dylan’s progression in working with Levy. The notion of writing fictional stories and setting them as songs was developing through the year but was interrupted by the idea of songs about real people. So after the totally imaginary Isis, we have the real life Joey, Rita May and Hurricane. Then it is as if the pair of writers closed the door on that and perhaps thought – we can have a lot more fun and a lot less trouble with fiction. Although of course Dylan’s commitment to Joey and Hurricane cannot be doubted. It seems to me, by the time the pair got to the end of their work together they had really got the hang of the relationship and were able to launch into much more exciting and interesting fictional works. If only they had time to develop this side of their work further we could have had a second album of collaborative fiction, rather than having to wait a couple of years for Street Legal (although in the end it turned out to be worth the wait). with Romance being, as I’ve said, the final collaboration between Dylan and Levy. Dylan had been in Mexico in 1972/3 but there seems to be little influence on his music from this period – until now. Levy stated in an interview that the two writers wrote the opening of the song, and then Levy finished it off, perhaps (according to Heylin) to Dylan’s slight annoyance. This is one of those songs where we have two excellently arranged different versions – the slow version on the album, and the upbeat Biograph live version. Heylin makes it very clear that it prefers the Biograph version, but I fear he misses something profound in the original album version, namely the extraordinary way in which Dylan plays with the timing. Indeed I can’t imagine how the song was possibly recorded with the whole band playing together (in Dylan’s preferred style), as there are so many twists and turns to the lyrics are handled. Sometimes an extra beat appears at the end of a line, sometimes the line takes an extra beat or two at the end. The time signature changes wildly as we go; I can imagine Frank Zappa rehearsing this to perfection, but not Dylan! The only thing I can think is that they multi-tracked the whole thing, and then kept the Dylan lyrics and gradually replaced all the instrumentals around that. Certainly there is a hell of lot happening in there, and the normal odd slips by the instrumentalists that we get on Dylan albums are missing. But whatever the explanation, what we have here is the summation of the work of these two fine artists, now utterly used to working together. And I think, despite the way the songs slip into each other on Desire, with Black Diamond Bay seeping out of Durango, it is worth just occasionally playing the sequence in the order the songs were written. It does give a different understanding to this period of work. Is there a more evocative opening of any Dylan song than this? I think this time we shall escape. And I’ll play for Magdalena as we ride. And we have the history and culture mingled with the hopes of the poor. Then I see the bloody face of Ramona. And just as I am sure you can improve on my language skills, so I am sure there must be a reader more versed in Mexican history than me, but I am taking it that Ramona is the leader of the Zapatista Army of National Liberation. As I understand it she was one of a number of female commanders in charge of directing the army; a symbol of equality and dignity for impoverished women. When they rode with Villa into Torreon. Pancho Villa is a revolutionary folk hero, who fought against the regimes of both Porfirio Díaz and Victoriano Huerta. A torero is a bull fighter (I knew that time studying Latin would come in useful one day!) and Torreon is a city – I had to look that one up, tell me about it if you know why it is important in the context of the song – unless of course it is just a play on sounds having a “young torero” and riding into Torreon. So having run away the couple prepare for marriage. You’ll shine with diamonds in your wedding gown. With His serpent eyes of obsidian. Was that the thunder that I heard? Oh can it be that I am slain ? We may not make it through the night. The outlaw is killed, his lover is left, and I suppose that bleakness is what makes me feel in part that the slower album version works better than the Biograph version. That and the fact that the Biograph version, having been played live, has got rid of all the edgy changes of rhythm, time, bar length and everything else that makes the original version so extraordinary. The same chords are used through the chorus. The song was played 38 times by Dylan between October 30 1975 and October 17 2015. It is, for me a most fitting and insightful end to an era in Dylan’s writing. With the death of the outlaw at the end of the song, the curtain comes down on a singular period in Dylan’s career. When he took up songwriting again, we found we were in a new land. How Dylan writes songs, and other articles. Dylan’s songs in the order they were written. May be worth noting that it’s not Ramona, but Ramon. Like Roman is the guy he killed and the reason they are on the run. I enjoyed your post, which I found in a fit of enjoying Romance in Durango. I love Dylan’s ability to convey a story in a few words. The eyes are gone, but they would have been obsidian, which would glow when the light was right. I’ve stood next to them, and they’re huge and imposing (the photo doesn’t quite do them justice). It would have been an awe-inspiring sight. The Aztecs discovered Teotihuacan when it was already abandoned and overgrown – a lost civilisation. They were so astonished and overawed by the size of the two main pyramids, they decided it was where the gods had created the sun and the moon, and the pyramids are now named accordingly. 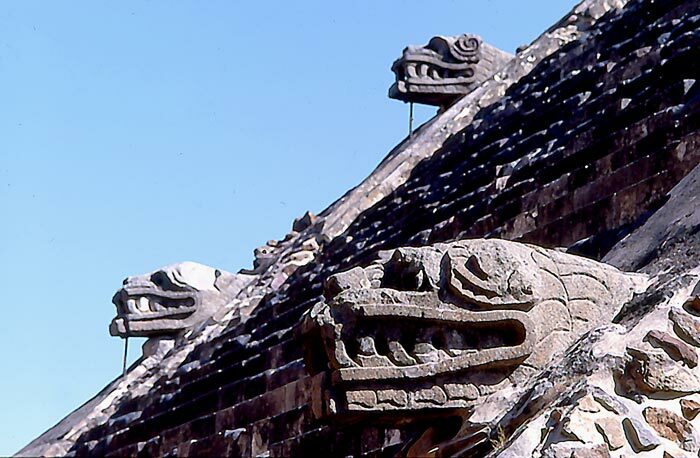 The Aztecs also adopted the plumed serpent god, and called it Quetzalcóatl. Hello, This is an interesting essay. Come and join us inside Bob Dylan’s Music Box http://thebobdylanproject.com/Song/id/531/Romance-in-Durango and listen to every version of every song composed, recorded or performed by Bob Dylan, plus all the great covers and so much more. I’ve always assumed this song was set in Mexico as well. This weekend, though, I was in Durango, Colorado. And visited the nearby town of Aztec, New Mexico. Another musical feast from the mind of Bob Dylan. The lyrics, the guitar work, the timing, the beat and no beat and the feedback from the audience all make this a memorable recording. I don’t think Ramón (not Ramona) is a member of Zapata revolutionaries. It’s more probable the protagonist and Magdalena are: they are linked by Dylan to Pancho Villa, their ancestors fought with him. About why Torreon is mentioned, that’s because the song is set during the Mexican Revolution. Villa had a key battle in Torreón, taking the city back in 1914 (between March 19th and April 2nd of that year).